Nigerian Army Chief Suspects Hanci-panci, Warn Officers To Steer Clear From Politics! 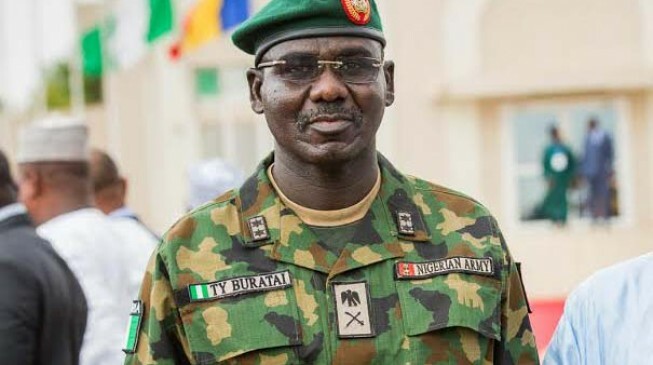 Following rumors that some civilians are approaching some army officers and soldiers for undisclosed political reasons, the Chief of Army Staff, Lt. General Tukur Buratai, has warned his officers to steer clear of political issues. Gen. Buratai gave the warning In a statement released yesterday's evening through the Director Army Public Relations, Brig. General. Sani Usman. In the statement, Buratai said this is unacceptable and that soldiers must remain apolitical at all times. "This is to inform the public that the Chief of Army Staff (COAS), Nigerian Army, Lieutenant General TY Buratai, has received information that some individuals have been approaching some officers and soldiers for undisclosed political reasons. On the basis of that, he has warned such persons to desist from these acts. He also reminded them that Nigerian Army is a thorough professional, disciplined, loyal and apolitical institution that has clear Constitutional roles and responsibilities. Therefore, he seriously warned and advised all officers and soldiers interested in politics, to resign their commission or apply for voluntary discharge forthwith. Any officer or soldier of Nigerian Army found to be hobnobbing with such elements or engaged in unprofessional conducts such as politicking would have himself or herself to blame.